AspCoreGen 2.0 MVC Express is a free ASP.NET Core 2.0 MVC Code Generator software you can download absolutely free. 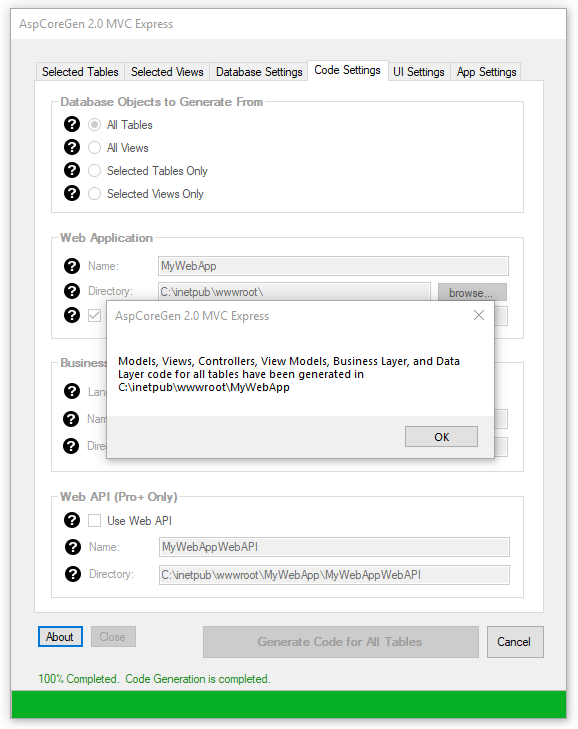 AspCoreGen 2.0 MVC Express generates a full solution with 2 projects; An ASP.NET Core 2.0 MVC Web Application project (main application - UI), and a .NET Core 2.0 Class Library Project (business tier, data tier, and shared libraries). 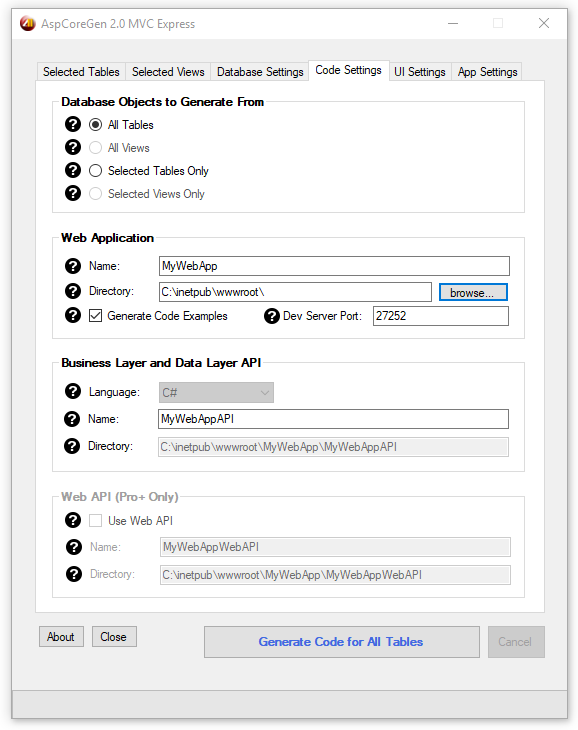 The optional ASP.NET Core 2.0 Web API project can only be generated using the Professional Plus Edition. 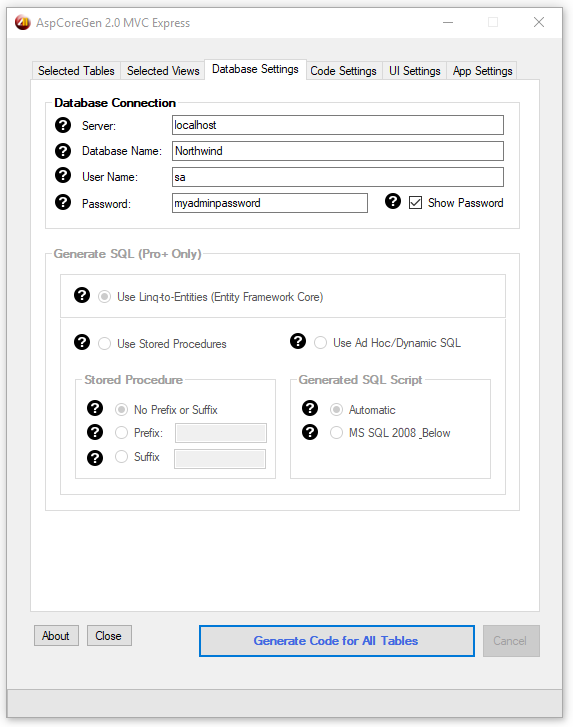 It generates code by looking at your Microsoft SQL Server Database's tables. 1. Download AspCoreGen 2.0 MVC Express here: https://junnark.com/Products/AspCoreGen2MVC/DownloadExpress. 2. Install it. Just follow all the prompts. If you need a tutorial go here: https://junnark.com/Products/AspCoreGen2MVC/Tutorials/ and click on the Installation Guide link. 3. Open AspCoreGen 2.0 MVC Express, go to the Database Settings tab and enter the following information shown in the snapshot below. Note: Use your database's username and password instead of the one's shown below. A blank password will not work. 5. 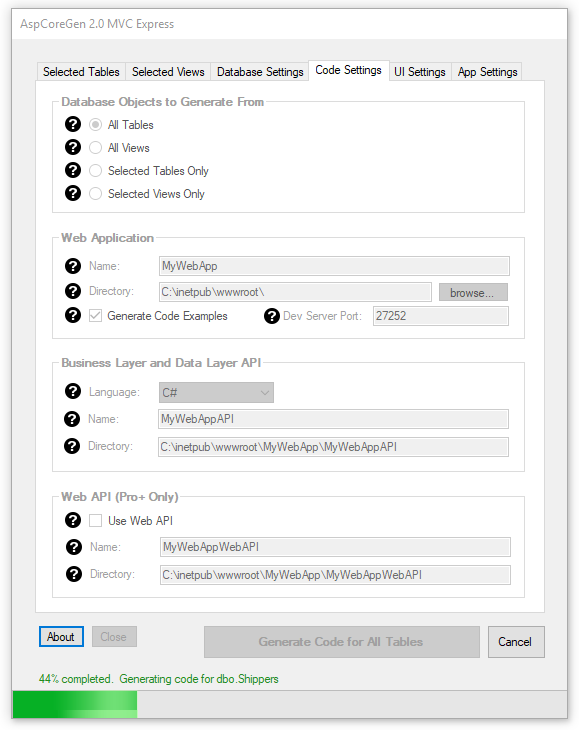 Click the Generate Code for All Tables or the Generate Code for Selected Tables Only button. AspCoreGen 2.0 MVC Express will start generating code and you will see a message once code generation is done. 6. Close (or not) AspCoreGen 2.0 MVC Express. Go to the Directory you specified and double-click the Solution file (.sln). 8. 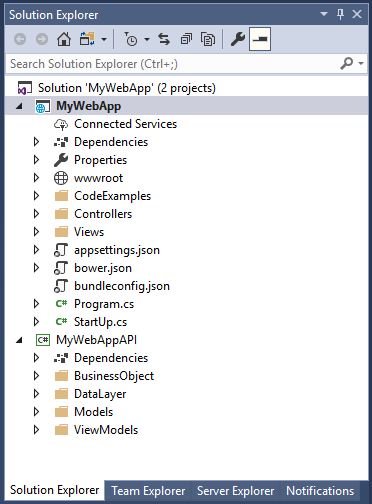 The home page shows all the major objects that was generated by AspCoreGen 2.0 MVC Express. The black bars represents the separate projects. Below each black bar are categories of objects (blue bar) generated for that specific project. Clicking the blue bar will toggle visibility of the list of items for that category. Items under the Views Folder are MVC Views (.cshtml) and are clickable to demonstrate each MVC View's functionality. 9. Click on one of the web page links, e.g. the Products/Unbound. 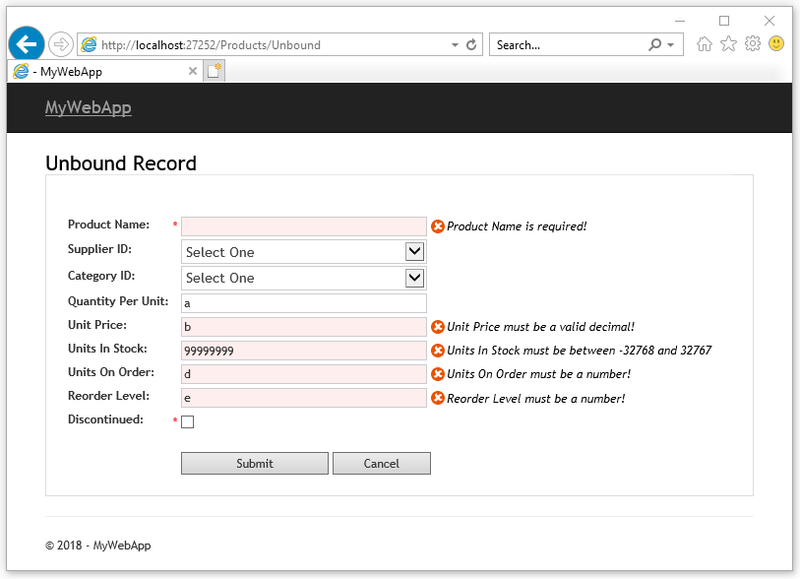 You will notice that each field in the Products table are shown here. Foreign keys are also shown as a Select List web control. There's also validation, for example Product Name here is a required field. 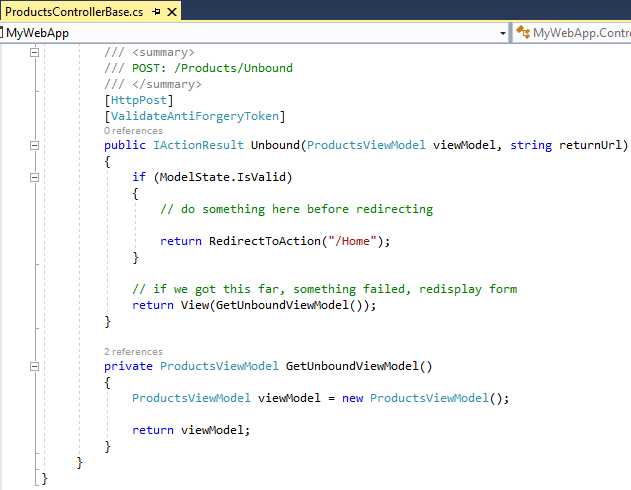 Note: AspCoreGen 2.0 MVC Express generates Unbound MVC Views, these are Views that are not bound to a database. Because these MVC Views are not bound to the database, you will notice that the Select List for the Supplier ID and Category ID does not have data, and when you click Submit button nothing happens, it will not Insert or Update something in the database. 11. 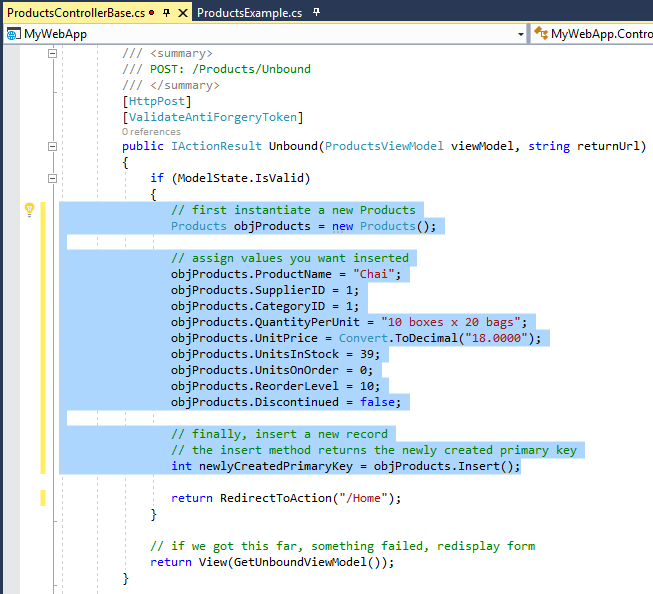 Since AspCoreGen 2.0 MVC Express does not generate code that binds web views to the database, let's bind the MVC View to the database by adding logic to the ProductsControllerBase.cs file under the Controller/Base folder. 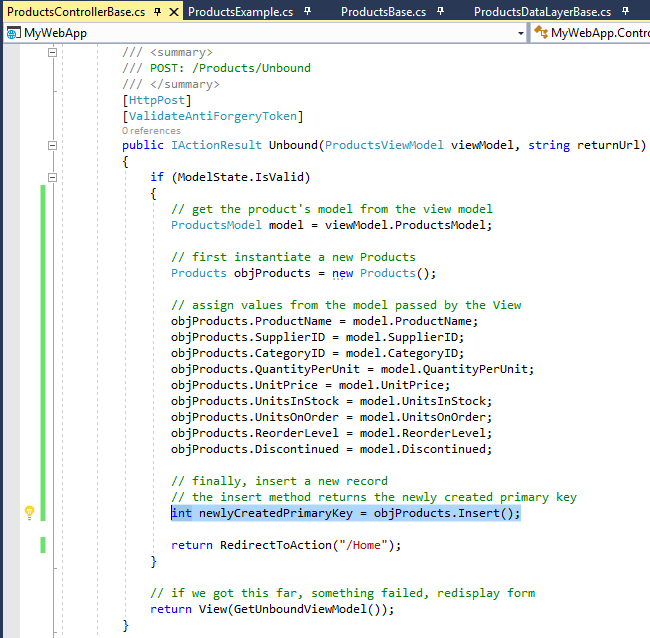 Open the class ProductsExample.cs under the CodeExamples folder and then copy the code from the Insert method to the ProductsControllerBase.cs's Unbound IActionResult method. 15. Note that the Products's Insert Data Layer method shown below has no code, just a code throwing a NotImplementedException error. This is one of the main difference with AspCoreGen 2.0 MVC Express and Professional Edition, that's why Express generated MVC Views are not bound to a database. Assign the Middle Tier values passed by the UI tier to whatever objects you have. 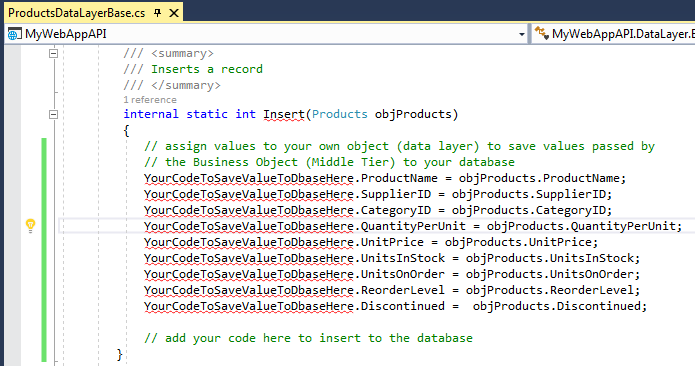 Your objects could be an Entity Framework, or whatever you wish to use that will interact with your database. 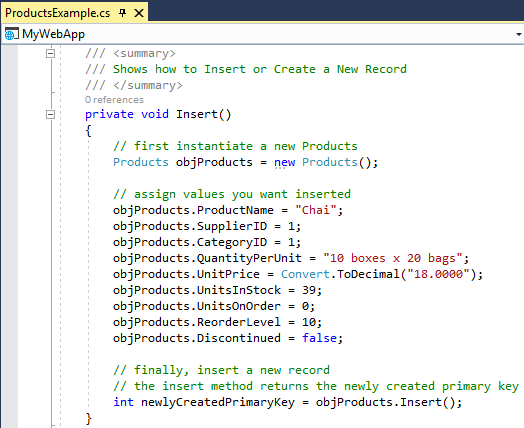 Or you can just buy the AspCoreGen 2.0 MVC Professional Plus so that you don't even need to worry about the data layer, it should generate this part as well as the respective Linq-to-Entities classes (EF Core), ore Stored Procedures, or Ad-Hoc SQL (sorry for the marketing spiel). ** One Click. As programmers we develop for one project until we're done or get pulled to another project. This means using the same database over and over again, adding more tables or fields to existing tables and/or views, or updating them. The "One Click" feature becomes really handy the next time you generate code for the same database, all you have to do is click the Generate Code for All Tables button when working on the same database, and that's it. AspCoreGen 2.0 MVC Express is absolutely free, no need to register, no pop-ups asking you to buy the Professional Plus edition, no marketing/unsolicited emails whatsoever, yup - it's absolutely free.